A typical training session consists of a warm-up and stretching. After arriving early and changing quickly into one’s gi, students wait quietly at the edge of the dojo. Please ensue that dojo etiquette is maintained at all times. Please bow before entering the dojo (also upon leaving the dojo, please also bow – this encourages the ethos of the dojo etiquette). The sensei will call everyone to line up. The higher grades will line towards the left hand side of the dojo (when facing the instructor). 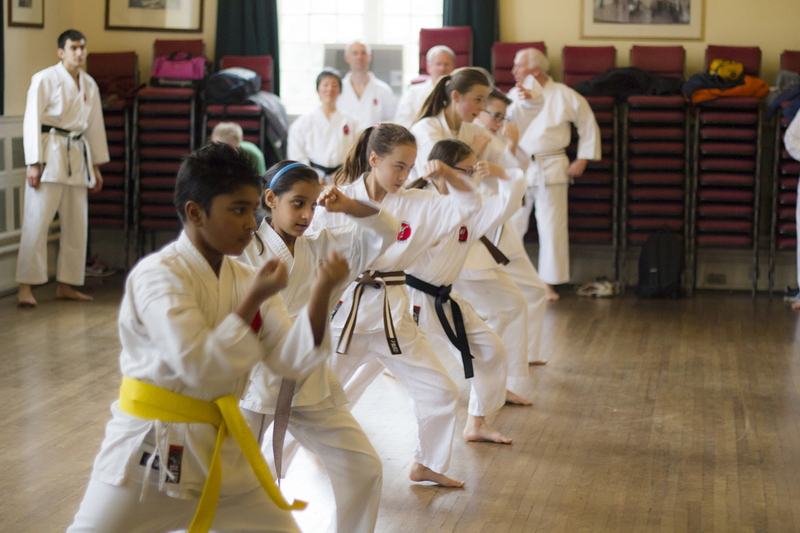 All other grades line up next to the higher grades, preferably with smaller students at the front in order to see the sensei and any demonstrated techniques more clearly. The sensei will kneel first and the senpai will call “seiza” (everyone to kneel). “Rei” will called and everyone bows together. The sensei (or upon invitation of the sensei) the senpai will be called to warm up the class. Warming up is a vital part of the class as it stretches muscles and joints as well as increasing the cardiovascular blood rate to perform techniques. Failure to warm up increases the risk of potential injury from a pulled muscle, cramp or other injury. The warm up normally lasts 10 to 15 minutes. 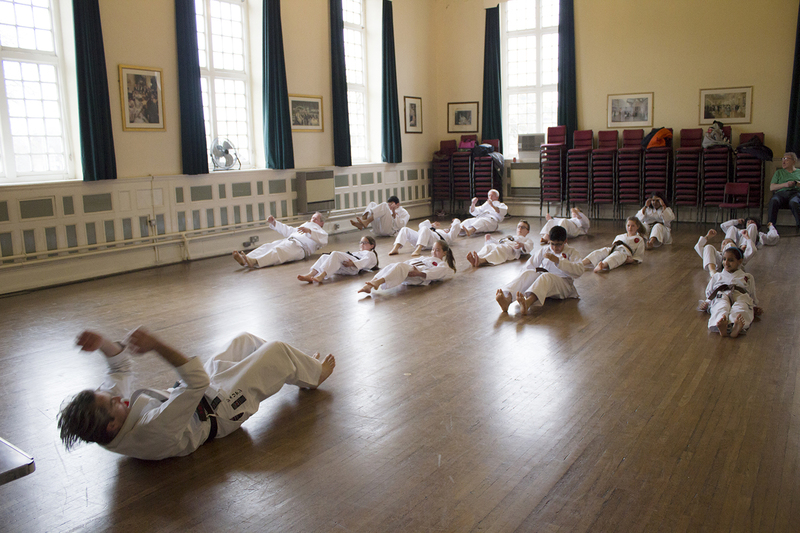 It is vital that if you arrive late that you perform stretching exercises before entering the dojo as this minimises the risk of an injury. Stretches are performed on most parts of the body such as arm stretches, trunk stretches, side stretches, leg swings, neck rolls, push ups, sit ups and many more. Arriving late – while every effort to arrive on time, please ensure that you have warmed up before joining the class late. The start of the lesson will involve basic punching and kicking techniques, correct use of hip movement, stance measurement, blocking techniques and footwork positioning. Sometimes, techniques will be built up in a way so at to be demonstrated later in the lesson with a partner during kumite or as a further study of a kata. It is worth noting that the instructor varies the level of techniques to the students attending. For example, a beginners lesson will be more basic, focusing on simple punching, kicking, blocking and stances, whereas an intermediate or advanced lesson will concentrate on more advanced techniques or movements. Kumite is performed at a variety of levels. Beginners will perform very basic and non-contact kumite with another beginner or higher grade who is instructed to vary the level of their technique to the student they are partnering. Basic punching and kicking with corresponding blocking is practised, building on techniques practised in the basic part of the class. Higher grade kumite is built up in the same way but may advance to semi free movements between partners to practice and techniques such as timing or countering. 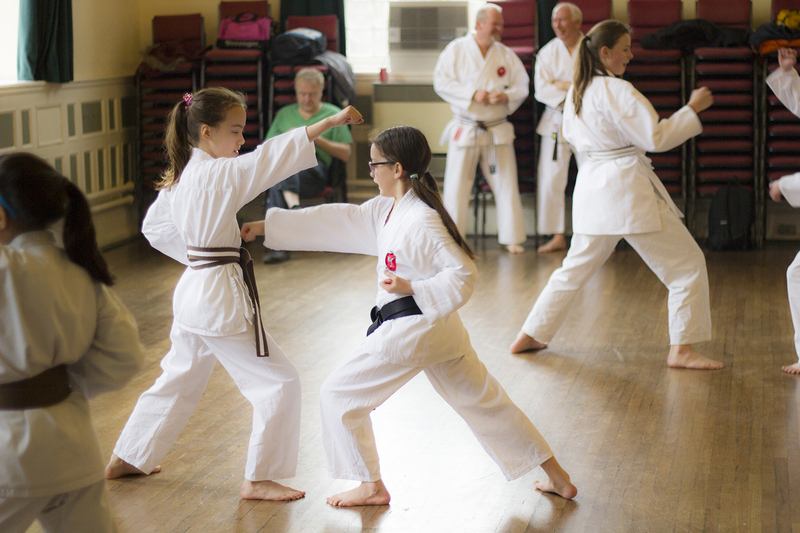 Kata is a fixed sequence of movements stressing different aspects such as breathing, balance, speed etc taking the form of several imaginary attackers from different directions with a specific defence and attack. 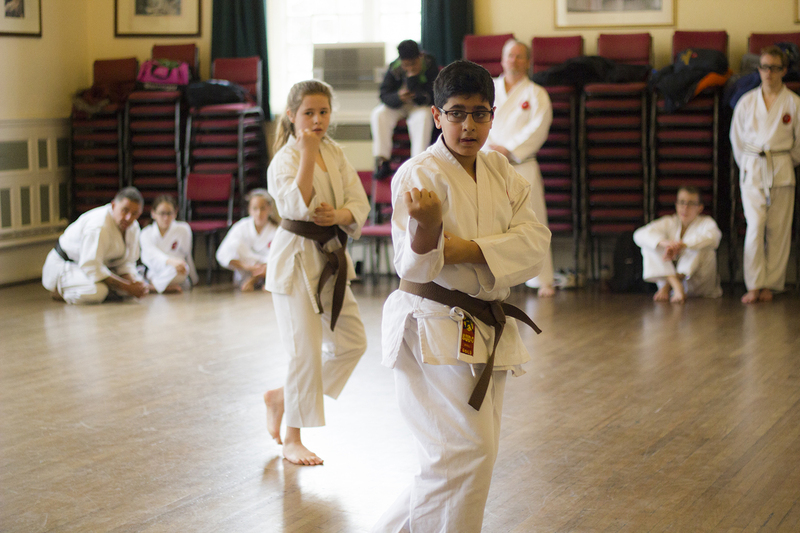 Depending on the level of the student, kata is broadly split into basic and advanced with basic techniques usually practised as part of the warm up or basic class being applied later in the kata part of the lesson. Just as it is important to warm up at the start of the lesson, it is important to warm down before the end. A few simple stretching exercises with possibly a few sit ups/press ups will conclude the class. The instructor will ask everyone to line up and as at the start of the lesson, everyone will line up with the higher grades. Seiza will be called and the instructor will kneel facing the front of the dojo (i.e. with their back to the class) followed by the rest of the class. The senpai will say out loud the dojo kun which is repeated by the class. The senpai will then call, “Shomani – rei” (bow to the spirit of the dojo). The sensei will turn round and face the class and the senpai will call out “Sensei rei” (bow to the instructor) and finally “Otagani-rei” (bow to each other). The sensei will bow to the class and walk off. The higher grades will stand up first, bow to the class followed by all the other belts. Please ensure you collect all your belongings from the changing facilities and the dojo before leaving. Before leaving the dojo, please before finally exiting.